What temperature is best for our baby? 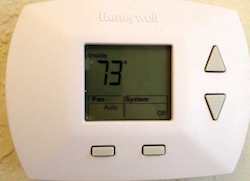 Keep your home at a temperature where you as parents are comfortable - 73 degrees if fine. I would dress your baby a little warmer than you and swaddle him in a blanket. A one month old is old enough to let you know (through crying) if he is uncomfortable. As for “the experts” who recommend 60 degrees, I’d bet they either sell air conditioning systems or are referring to heating the home up to the high 60s.